By Keith Cowing on November 30, 2010 8:25 PM. "On December 4 and 5, in over twenty locations around the world, Google, Microsoft, Yahoo!, NASA and The World Bank will host the third Random Hacks of Kindness (RHoK), their progressive initiative that brings together volunteer software developers and experts in disaster risk management for a weekend-long "hackathon" to create software solutions that can help mitigate or respond to disasters around the world and help save lives. ... "NASA is proud to be supporting Random Hacks of Kindness and promote wider usage of our open data to solve the world's greatest challenges," said NASA CIO Linda Cureton." Keith's note: In advance of the previous Random Hacks of Kindness (RHoK) event in June 2010, NASA did absolutely nothing to inform the public in advance that it was supporting the event and that NASA personnel were participating - thus leaving the agency's participation to a few hand-picked individuals. At the time, NASA's CIO told me that there would be a summary posted of NASA's participation in the previous RHoK event. No such summary has ever been posted or distributed. Once again, NASA has not issued a press release or media advisory for this new RHoK event. NASA's CIO says that NASA is "supporting" this event yet there is no information in this RHoK press release or anywhere at NASA.gov (CIO, CTO, etc.) as to the location(s) where NASA will be participating or the nature of NASA's "support". How are people supposed to know about NASA's role in these events if NASA does not tell anyone? Or is this yet another event where only a few NASA personnel will participate - and never tell anyone what they did? By Keith Cowing on November 30, 2010 5:11 PM. "Welcome to NASA's On-line Partnering Tool! This application has been designed specifically to help you align your top interests with NASA's most appropriate experts. As the interactive tool walks you through the path to partnership, you will be asked to identify your specialized areas of interest. If you don't see an exact match please mark "other" and add additional details in the text box. Once you complete the tool's questions, your information will be submitted directly to NASA. 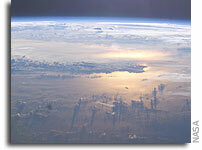 An introductory email will be sent on your behalf to the NASA locations which are expert in your fields of interest." Keith's note: I am still baffled as to why NASA Chief Technologist Bobby Braun's Office is so utterly incapable of issuing press releases and other advisories about interesting things such as this "On-line Partnering Tool". There's more to good PR than a Twitter post a week and a half ago, Bobby. By Keith Cowing on November 30, 2010 5:00 PM. "Orbital Sciences Corporation announced today that former White House Space Policy Director Peter J. Marquez has joined the company as Vice President of Strategy and Planning. ... "Orbital is very pleased to welcome Peter to our senior management team. His recent background in formulating and implementing a comprehensive update to the nation's space policy will bring the company extraordinary insight into how we can best serve the country's space needs and interests in a difficult budget environment," said Mr. Hamel. "The time is especially opportune for Peter to join Orbital, as the government is currently considering the future direction of space programs to allow civilian agencies and defense and intelligence customers to accomplish their critical missions. Orbital is well-positioned to support these government procurement initiatives and Peter's knowledge will help us advance our strategic interests." By Keith Cowing on November 29, 2010 4:08 PM. "In a rare one-on-one interview with a U.S. reporter Nov. 23, Bolden tiptoed around a range of sensitive issues as he looks for bipartisan support in the 112th Congress for the new U.S. space program that is still evolving at NASA." "In a brief question-and-answer session with reporters Nov. 12 following a ribbon-cutting ceremony at Orbital's new "Mission Control Center-Dulles ..."
Keith's note: Once again, Charlie Bolden will not make himself available to the media except in hand-selected, tightly-controlled situations where only a few select individuals are given access. None of this is ever announced in advance to the media - or the public. By Keith Cowing on November 29, 2010 9:03 AM. "The university last year sued six digital-camera makers, including Canon Inc. and Nikon Corp. for infringing six patents for pixel sensors. The inventions came from research Caltech did for the U.S. National Aeronautics and Space Administration." "Last year Caltech sued Canon, Nikon and 4 other digital-camera makers, for infringing on six patents relating to pixel sensors in digital cameras. All of the patents were granted following research the university was doing for NASA. The case is California Institute of Technology v. STMicroelectronics, 10-9099, U.S. District Court, Central District of California (Los Angeles)." Keith's note: While NASA Headquarters and its field centers are off openly promoting the spinoff potential of what NASA does to the public and private sector, Caltech decides to get greedy and sour that the very effort by going after companies that have employed NASA-funded technology. NASA paid Caltech/JPL for all of this work using taxpayer dollars. That said, Caltech may well have the theoretical fine point of legality on their side, but its unfortunate that they decide to treat their NASA work as a cash cow that they can milk instead of seeing this work as a service that they provide to the nation. By Keith Cowing on November 29, 2010 7:20 AM. "The Kappa Iota Chapter of Omega Psi Phi Fraternity, Inc. in association with the Pearl Group, Inc. announced that Charles F. Bolden, Jr., administrator of the National Aeronautics and Space Administration (NASA), will be the featured speaker at Kappa Iota's annual Achievement Week Program. The program will be held on Dec. 2 at the Chattanooga Trade and Convention Center." Keith's note: Of course no media will be allowed in to ask Bolden questions, no transcript of his comments will be posted, etc. By Keith Cowing on November 29, 2010 7:19 AM. "Earth and space science missions developed and implemented by federal agencies in collaboration typically result in additional complexity and cost and increased risks from divided responsibilities and accountability, says a new report from the National Research Council. Federal agencies should not partner in conducting space and earth science missions unless there is a compelling reason to do so and clear criteria are met in advance. Keith's note: Just look at the membership rooster - its NASA/industry/advisory revolving door and inbred self-interest at work once again. Where's the incentive to change anything when you contune to ask the same people the same questions - only to get the same answers again and again? Oh yes: the report was paid for by NASA - so the answer was more or less pre-ordained. Various agencies do not get along becuase they do not want to get along - it is not in their self interest to be more efficient because that would undermine their individual budget request rationales every year. Oh well. I can't wait to hear Charlie Bolden's inane ghost written commentary on this. By Keith Cowing on November 29, 2010 7:00 AM. "While NASA has officially given up its plans to send humans back to the surface of the moon anytime soon, a contractor is proposing a mission to send a crew to a stationary spot in orbit over the far side of Earth's neighbor. 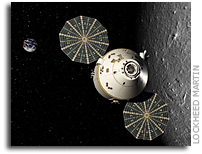 Lockheed Martin has begun pitching an L2-Farside Mission using its Orion spacecraft under development." "At least some of the incoming Republican panel chairmen and other senior GOP lawmakers, these officials said, may view the proposed test flight as circumventing congressional language to quickly develop a new heavy-lift NASA rocket able to transport astronauts past low-earth orbit. Congress has adopted language strongly favoring space-shuttle derived rockets for this purpose, rather than a version of the Delta IV. The Delta IV is operated by a joint venture between Lockheed Martin and Boeing Co."
Keith's note: Bravo Lockheed Martin. A near-term, private sector solution to human space flight, using a commercially available rocket and Orion - much sooner than Ares 1 could have ever done so. Now, sit back and watch as the (otherwise) pro-business Republicans in Congress - especially ATK's congressional delegation - try and stop it. By Marc Boucher on November 27, 2010 9:32 AM. "Maybe you saw the fireball over the Sierra Mountains. If you were on the East Coast, it happened at about 1:52 a.m. on Saturday and in full view of the locals and whomever else stayed up to watch Nevada At Night on ESPN. We can now confirm that the flames came from Boise State's heat tiles as the Broncos re-entered the earth's atmosphere. Parachutes did not deploy on the BSU capsule." Marc's note: I love football as anyone who knows me can attest to but imagine my shock when reading the first two paragraphs of this story. What was the writer thinking, seriously? It was more than distasteful, it is extremely disrespectful. Seven astronauts lost their lives on Columbia on February 1, 2003. To my knowledge no one died playing the football game last night. Sorry folks, I'm not one to rant, but the ESPN writer of this story, Gene Wojciechowsk (GenoEspn on Twitter), needs to apologize in my opinion. By Marc Boucher on November 26, 2010 2:37 PM. "On November 18, the Astronomy and Astrophysics Advisory Committee sent a letter regarding Pu-238 production to NASA Administrator Charles Bolden, Energy Secretary Steven Chu, Senate Commerce, Science, and Transportation Committee Chairman John Rockefeller (D-WV), House Science and Technology Committee Chairman Bart Gordon (D-TN), Energy Undersecretary for Science Steven Koonin, Office of Science Director William Brinkman, and NASA Associate Administrator Edward Weiler. Expressing concern that a further delay in Pu-238 production will hinder outer solar system planetary missions and future astrophysics missions, the letter urges "prompt action be taken and appropriate budgetary resources be identified through cooperative coordination between DOE, NASA, and, if applicable, other federal agencies (i.e., NNSA, Dept. Homeland Security), to enable the Pu-238 project production restart for deep space mission applications." By Keith Cowing on November 26, 2010 12:10 PM. "Last week, NASA contractors moved the two, 59-foot-long X-34s from open storage to a test pilot school in California's Mojave Desert. There, workers from Orbital Sciences, the X-34's original builder, will inspect the two robotic rocketships with an eye to flying them again." "But that doesn't mean NASA has formal plans to operate the X-34s under its own auspices, now or ever, [Dryden official Alan] Brown stressed. 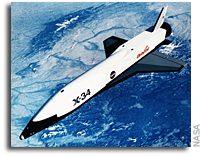 Provided they're in flyable shape, it's far more likely the space agency will make the X-34s available to private industry. "There are a number of firms interested in these things, developing communications and other technologies," Brown said. "It would be helpful if they had a vehicle." By Keith Cowing on November 26, 2010 10:11 AM. "... Carmody and Goglia are two NTSB members who faulted the leadership style of Ellen Engleman Conners, who was chairwoman of the board from 2003 to 2005, for the decline in investigations during the Bush administration. Engleman Conners required all board votes be unanimous, something that had never been common practice, they said. She also was very frugal, which former Democratic board members say was problematic to the conduct of investigations. "You couldn't buy anything without her signature," said John Goglia, Engleman Conners, who resigned in May 2006 after withdrawing her re-nomination as chairwoman in December 2005, now works for NASA at the Johnson Space Center in Houston. She declined repeated requests for an interview." By Keith Cowing on November 26, 2010 8:28 AM. "Expedition 25 Commander Doug Wheelock and Flight Engineers Shannon Walker and Fyodor Yurchikhin safely landed their Soyuz spacecraft on the Kazakhstan steppe Thursday, wrapping up a five-month stay aboard the International Space Station. Russian cosmonaut Yurchikhin, the Soyuz commander, was at the controls of the spacecraft as it undocked at 8:23 p.m. EST from the station's Rassvet module. The trio landed at 11:46 p.m. (10:46 a.m. on Nov. 26 local time) at a site northeast of the town of Arkalyk." By Marc Boucher on November 24, 2010 4:45 PM. "The Program Requirements Control Board (PRCB) reviewed on Wednesday repairs and engineering evaluations associated with cracks on two 21-foot-long, U-shaped aluminum brackets, called stringers, on the shuttle's external tank. Managers decided the analysis and tests required to launch Discovery safely are not complete. The work will continue through next week." By Keith Cowing on November 23, 2010 2:56 PM. "Masten Space Systems and Space Florida announced today the signing of a Letter of Intent to explore performing demonstration launches of a Masten suborbital reusable launch vehicle from Launch Complex 36 at Cape Canaveral Air Force Station. "We have been looking at Florida as a launch option for some time now," stated Masten Founder and CEO Dave Masten. "We are excited to begin the process of determining if Launch Complex 36 is a good location for our flight operations, and hope to attempt a demonstration launch sometime in 2011." By Keith Cowing on November 23, 2010 1:31 PM. "Some ideas, on the other hand, have taken a little longer than we anticipated and need some extra time in order to be done correctly. To articulate the status of all of these milestones, we're launching the new Open Government Status Dashboard, which details the status of all 39 three-month goals in an easy-to-read format. We'll work to keep this status page updates as milestones are achieved." Keith's note: Of course, as eager as this group is, they never seem to get press releases out to tell people what they are doing. This item was posted a month ago at NASA.gov. "NASA, the White House and People for the Ethical Treatment of Animals (PETA) outpace other public sector organizations when it comes to social media savvy and online strategy, according to the first annual Digital IQ Index(R) for the Public Sector." Keith's update: Here we go again. One tweet and a retweet from several NASA civil servants. That's it. Yet again, no press release, or coordinated NASA.gov use of social media to promote a study that recognizes NASA's social media prowess. How ironic. Keith's 3:30 pm Update update: NASA finally got around to issuing a press release at 3:00 pm EST 15 hours after it was released by others - and thus missed a whole news cycle. So much for making the best use of "social media and online strategy". By Keith Cowing on November 22, 2010 5:00 PM. "Congratulations to the SpaceX team for receiving the Federal Aviation Administration's first-ever commercial license to reenter a spacecraft from Earth orbit," NASA Administrator Charlie Bolden said. "With this license in hand, SpaceX can proceed with its launch of the Dragon capsule. The flight of Dragon will be an important step toward commercial cargo delivery to the International Space Station. NASA wishes SpaceX every success with the launch." By Keith Cowing on November 22, 2010 2:10 PM. NASA: Medium Launch Transition Strategy Leverages Ongoing Investments but Is Not Without Risk. "NASA's plan has inherent risks that need to be mitigated. NASA has not developed detailed estimates of the time and money required to resolve technical issues likely to arise during the launch vehicle certification process. As these costs are currently unknown, according to Science Mission Directorate officials, NASA has not yet budgeted for them. Further, both space station resupply vehicles have experienced delays and more delays are likely as launch vehicle development is an inherently risky endeavor. Neither potential provider currently has the facilities needed to launch the majority of NASA earth science missions requiring a medium capability." By Keith Cowing on November 21, 2010 1:42 PM. "Senate Democrats -- including typically mild-mannered Bill Nelson of Florida -- lit into President Barack Obama during an unusually tense air-clearing caucus session on Thursday, senators and staffers told POLITICO. Nelson told colleagues Obama's unpopularity has become a serious liability for Democrats in his state and blamed the president for creating a toxic political environment for Democrats nationwide, according to two Democrats familiar with his remarks." "He [Nelson] has allowed NASA to be destroyed," [Florida Senate President Mike] Haridopolos said. "That's 20,000 jobs, let alone the more important component which is national security. That's why, I think, people who have been long-time Bill Nelson supporters are calling people like me and saying we want you to challenge Bill Nelson because he's not standing up for Florida." "[Nelson] put part of the blame on communication failures, such as a misconception that Obama wants to eliminate the manned space program. The White House also needs to do a better job explaining things like the fact that tax cuts made up 40 percent of the stimulus bill, Nelson said. "$200 billion dollars of tax cuts and nobody knows it because it hasn't been told," he said." Bolden: "I Don't Read The Blogs"
By Keith Cowing on November 21, 2010 8:08 AM. Bolden: Page 19. "I don't read the blogs. You all can read them. You know all they do is just upset my day so I don't read them, and you read them if you want. I know what you're doing. You know what you're doing, and you don't need anybody else to tell you, you know, what you're doing and the quality of your work. So if you want to go read somebody who's going to be critical of you everyday, have at it. I don't recommend it. If you need that, that's okay." Bolden: Page 30: "I was in Prague. Let me tell you why I tell you don't read the blogs okay? You can. I can't stop you." Keith's note: NASA MSFC PAO has decided not to post this for the rest of NASA and taxpayers to read. It is fascinating how Charlie Bolden can claim not to read "the blogs" yet his staff certainly do - as do White House and Congressional staff. Yet he always seems to know what they say. Meanwhile he continues to be afraid to speak on the record with the media and/or to have details of his official trips to Saudi Arabia, Nepal, and China made public. If you refuse to talk to anyone outside of closed doors, how else are people going to know what you are doing if they don't read "the blogs" Charlie? How Long Will Charlie Bolden Continue to Hide From The Media - and The Public? By Keith Cowing on November 19, 2010 8:02 PM. "Bolden's comments were detailed in a transcript of the all-hands meeting obtained by Space News. His remarks covered myriad programmatic and policy issues, touching on plans to reduce facilities within the agency, build a new heavy-lift launch vehicle and implement management changes designed to curb cost growth on the James Webb Space Telescope, and the potential for future cooperation in human spaceflight with China." "Bolden's address was closed to reporters, but a transcript of the event was obtained by Space News." Keith's note: Alas, NASA has yet to see fit to publish this transcript. Meanwhile, Bolden has continued to refuse to tell taxpayers what he was up to in China - at their expense. As has been mentioned before, the White House has ordered Bolden not to talk to anyone on the record - especially the media - for fear of another gaff. This begs the question as to how long a public official can go hiding from the media - and the public - and still be considered NASA's "leader". By Keith Cowing on November 18, 2010 8:58 PM. "NASA managers have postponed a launch status meeting and news conference planned for Monday, Nov. 22. The Kennedy Space Center will begin the launch countdown no earlier than Nov. 30. That would support a launch attempt for Discovery no earlier than Dec. 3 at approximately 2:52 a.m. EST." By Keith Cowing on November 18, 2010 8:53 PM. "NASA has signaled an interest recently in possibly circumventing the law," Hatch said. "My purpose in calling this meeting was to explain in no uncertain terms the Utah congressional delegation's interest in ensuring that Utah's solid rocket motor industry is protected. Though they assured us that NASA would comply with the law, some of their answers reaffirmed my suspicions that we need to keep a very close watch on the agency. I will continue with other delegation members to ensure the agency abides by the law and protects this industry that is so vitally important to our national security and northern Utah's economy." By Keith Cowing on November 18, 2010 7:11 PM. "Courtney Stadd, NASA's chief of staff and White House liaison from 2001 to 2003, pleaded guilty in August to one conspiracy charge in a nine-count indictment. He was sentenced Thursday to serve 41 months in federal prison, followed by three years of supervised release." By Keith Cowing on November 18, 2010 1:55 PM. Keith's note: Question for NASA JSC Center Director Mike Coats: How much Lockheed Martin stock do you currently own? By Keith Cowing on November 18, 2010 1:34 PM. "The EPOXI mission's recent encounter with comet Hartley 2 provided the first images clear enough for scientists to link jets of dust and gas with specific surface features. NASA and other scientists have begun to analyze the images. The EPOXI spacecraft revealed a cometary snow storm created by carbon dioxide jets spewing out tons of golf-ball to basketball-sized fluffy ice particles from the peanut-shaped comet's rocky ends. 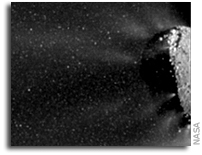 At the same time, a different process was causing water vapor to escape from the comet's smooth mid-section. This information sheds new light on the nature of comets and even planets." By Keith Cowing on November 18, 2010 10:02 AM. The U.S. Senate Committee on Commerce, Science, and Transportation announces the following full committee hearing titled Transition and Implementation: The Nasa Authorization Act of 2010." Keith's note: This hearing has been delayed to 1 December at 10:30 am. No reason for the delay has been given and no witnesses have been identified. By Keith Cowing on November 17, 2010 10:10 PM. "When Zero G Zero Tax was last seriously looked at by the joint taxation committee in 1999-2000 or thereabouts, they estimated that it would cost the treasury $10 billion over ten years so the nation could not afford it. Looking back today at the amount of money that is, it seems almost trivial considering the cost of so many mega-financial government and commercial deals in real estate, finance and other industrial sectors. Be that as it may, I think that ZGZT as it is called will bring in far more money to the treasury in the form of payroll taxes and economic growth in the form of jobs, good jobs than just about any other investment by the government in the future of an industry." By Keith Cowing on November 17, 2010 3:51 PM. "NASA Administrator Charles Bolden issued the following statement after participating in today's Head of Space Agencies Summit in Washington: "This year, the International Academy of Astronautics is marking the 50th anniversary of its founding in Stockholm, Sweden. I congratulate the academy for its dedication during the past five decades in bringing the world's experts together to discuss and promote space research and exploration. I also want to congratulate the academy on supporting today's Heads of Space Agencies Summit." Keith's note: Once again, Charlie Bolden used NASA's new Transporter to beam in and out of a meeting without any contact with the media. No media advisory in advance of Bolden's participation. No opportunity for media to ask him questions. Just a prepared statement written by someone at NASA PAO. Yet Bolden is just fine with talking to college newspapers at commencement ceremonies or giving comments to hand-picked media at Orbital's event last week. The strategy does seem to be working thought: we haven't heard any verbal gaffs lately. By Keith Cowing on November 17, 2010 12:39 PM. "The governing board of the U.S. Space and Rocket Center, home of world-famous U.S. Space Camp, meets in Huntsville today to do something many of its members thought they did in August: fire CEO Larry Capps. But in a year when space center board members don't agree on the center's financial health or its future, the fight over Capps is symbolic. If they're not sure they fired the CEO, what's going on at Alabama's top tourist attraction?" By Keith Cowing on November 17, 2010 10:30 AM. "When President Obama's bipartisan panel to reduce the federal budget deficit unveiled a proposal chock-full of deep spending cuts and tax increases last week, it sent ripples of angst across the country. The items that most set both Republican and Democrat hearts afire -- Social Security retirement age increases, gas tax raises, military cutbacks -- seemed to border on reasonable. But the one that got me was "eliminate funding for commercial spaceflight" to save $1.2 billion by 2015. I guess the post-Sputnik drive to have the best national space program in the world is officially being laid to rest. The panel obviously didn't recall the White House's reverence of "the compelling urge of man to explore and to discover" as stated on the front page of a 1958 booklet called "Introduction to Outer Space" which was produced to sell the idea of space exploration. Though Erskine Bowles and Alan Simpson, the panel's co-chairs, acknowledged that commercial spaceflight is a "worthy goal," they said they were unclear why the federal government should subsidize it." By Keith Cowing on November 17, 2010 10:22 AM. "Now NASA has released a draft (dated Oct. 8, 2010) of its requirements CCT-REQ-1130 ISS Crew Transportation and Services Requirements. I'd like for you to read it but it is behind NASA's IT firewall and you must have an ID and password to access it. I have read it and I'm disappointed. The document runs a mind-numbing 260 pages of densely spaced requirements. Most disappointing, on pages 7 to 11 is a table of 74 additional requirements documents which must be followed, in whole or in part. Taken all together, there are thousands of requirement statements referenced in this document. And for every one NASA will require a potential commercial space flight provider to document, prove, and verify with massive amounts of paperwork and/or electronic forms. This, folks is the old way of doing business. 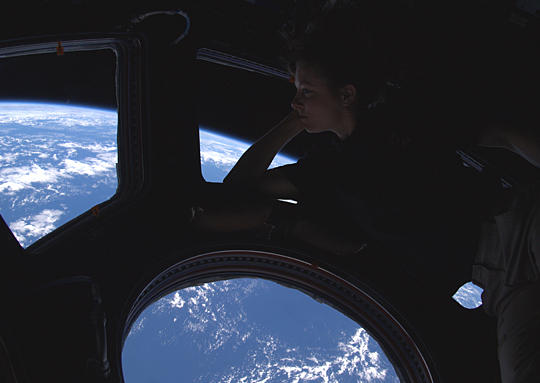 This is one of the major reasons why spaceflight is as costly as it is." Keith's note: I wonder if Soyuz will meet these requirements. It would be rather strange if it did not since we have certified it as being safe for American astronauts for more than a decade. Rest assured, if you asked this question of someone at NASA responsible for drafting these requirements, they'd really try and find a way not to answer it. "I have come to regret posting my essay on the coming wreck over commercial space flight. There are two reasons why..."
By Keith Cowing on November 17, 2010 8:51 AM. NASA Administrator Charles Bolden will hold an all-hands with Marshall employees at 10:30 a.m. Tuesday, Nov. 16, at Activities Building 4316. All Marshall team members are invited to attend. The all-hands will be available on Marshall TV and Desktop TV. Transportation will be provided. A bus schedule will be posted on Inside Marshall as soon as it becomes available." "NASA Administrator Charles Bolden Jr. was scheduled to meet with Huntsville's NASA employees this morning in a closed "all-hands" meeting. "The meeting is for employees only," Marshall Space Flight Center spokesman Dom Amatore said late Monday when asked if reporters could attend." By Keith Cowing on November 16, 2010 10:58 AM. "Efforts to develop commercial vehicles capable of carrying humans to the ISS and other low Earth orbit destinations present significant challenges. One issue of particular complexity is NASA's intent to "human-rate" any new flight system, whether developed commercially or by NASA. NASA only recently developed comprehensive human-rating standards for NASA-developed systems, and the certification process that will be used to human-rate commercial vehicles - several of which are already well under development - is not yet fully defined. Given the importance of this issue, the OIG is examining NASA's development of human-rating standards for commercial vehicles and will evaluate how commercial space transportation providers intend to implement NASA's safety and human-rating requirements." By Keith Cowing on November 16, 2010 10:46 AM. "While the Augustine commission report upon which the Obama Administration heavily relied in making the decision to cancel Constellation described strong public support for human exploration, as have past, similar surveys, the answer to a different question not asked is the important one: Compared with other areas of government funding, including health care, roads, education, defense and social welfare programs, where would you prioritize human space exploration? Unfortunately enthusiasm wanes in such a prioritization. Americans like and want a human space exploration program, they just see it as more expendable than other government programs." By Keith Cowing on November 16, 2010 8:51 AM. Keith's note: Yes, given these back-to-back cost overruns and schedule slips, after 8 years, it is time to fix something. But this is just two guys swapping chairs. Isn't something more substantive called for at NASA? Imagine how this would have been handled in the real world. By Keith Cowing on November 15, 2010 12:15 PM. "NASA Administrator Charles Bolden, vowing to fight for an early flight of Orbital Science Corp.'s Taurus II launch vehicle, says he can foresee the day when human spaceflight is controlled from the company's office-building campus near Washington Dulles International Airport. In a brief question-and-answer session with reporters Nov. 12 following a ribbon-cutting ceremony at Orbital's new "Mission Control Center-Dulles," Bolden said he will do everything he can to produce some $300 million in augmented funding for NASA's Commercial Orbital Transportation System (COTS) this year." Keith's note: Yet another stealth Bolden appearance. Obviously there was some hand picking of the media present who were then allowed to ask Bolden questions since no media advisory was issued for this event. By Keith Cowing on November 15, 2010 10:03 AM. "NASA Administrator Charles F. Bolden will receive the third honorary degree conferred by Air University, in recognition of his contributions in education, government, public service and community affairs, here 9 a.m., Monday. ... The ceremony is open for media coverage." Keith's note: Of course this media release went out from Maxwell AFB, not NASA PAO (they almost never mention these Bolden speaking events in advance) and it was issued the evening before a Federal holiday and a long weekend for many regarding an even first thing next Monday morning. That said, I wonder if the White House knows that Bolden will be made available to the mainstream media? By Keith Cowing on November 14, 2010 4:19 PM. "However, I am disappointed we have not maintained the level of cost control we strive to achieve -- something the American taxpayer deserves in all of our projects." Keith's note: "Disappointed"? That's the depth of your response to this? There was just a rather significant election a few days ago - one wherein the current Administration's approach to many things was repudiated. Add in the clear budget-cutting signal that permeated the electorate's response and one would think that you'd be a bit more agitated than being just "disappointed". Moroever, with the anti-incumbent message that the voters sent, one would think that you'd be contemplating a totally new approach to managing JWST. This is not some small mission. This is a multi-billion dollar, multi-decade program which, by its very size, affects the ability of the entire agency to operate given its continuing cost overruns. The people in charge - Scolese and Weiler - either did not detect or did not respond to these danger signals that were being sent to them. This happened on your watch. And all you are going to do is change the management chart leaving the same people at NASA HQ in charge? They did not catch these earlier problems. What makes you think that they will start to do so now? By Keith Cowing on November 12, 2010 7:51 AM. "Although our audit work identifies challenges to and weaknesses in NASA's information technology (IT) security program, we believe that the Agency is steadily working to improve its overall IT security posture. Our report to OMB cited that NASA established a program for certification and accreditation, security configuration management, incident response and reporting, security training, Plans of Actions and Milestones, remote access, account and identity management, continuous monitoring, business continuity/disaster recovery, and overseeing systems operated by contractors. However, we found that internal controls for these areas needed improvements." By Keith Cowing on November 11, 2010 9:01 AM. "The Commercial Spaceflight Federation, representing 37 companies employing thousands of Americans nationwide, released a statement opposing in the strongest possible terms the "illustrative cut" to commercial spaceflight put forth today by the co-chairs of the Deficit Commission." Webb Telescope: Too Big To Cancel? By Keith Cowing on November 10, 2010 7:00 PM. "We were missing a certain fraction of what was going on," NASA associate administrator Chris Scolese said in a late Wednesday afternoon teleconference. ... The fault "lies with us, no question about it," Scolese said. ... The Webb telescope is already late. When first announced more than a dozen years ago, it was supposed to launch in 2007. That was eventually delayed until 2014. The new report, issued at the request of the Sen. Barbara Mikulski, D-Md., says the earliest launch date now would be September 2015. Scolese said technically the telescope was not confirmed as a project until 2008 -- even though many millions of dollars had been spent on it and NASA had been promoting it since 1998. In 2008, NASA said it would cost $5 billion and that's the number to use for how overbudget it is, Scolese said. But previous numbers that NASA provided said it would cost $3.5 billion." By Marc Boucher on November 10, 2010 3:22 PM. "Robots have invaded the Kennedy Space Center (KSC) as NASA prepares to launch Space Shuttle Discovery on the STS-133 assembly mission to the International Space Station (ISS). But fear not, these robots are human made and friendly to earthlings - at least for now." By Keith Cowing on November 9, 2010 11:46 PM. "Maj. Gen. Charles Frank Bolden, Jr., 12th administrator of the National Aeronautics and Space Administration, will be the keynote speaker for N.C. A&T's December commencement. Commencement will be held Dec. 11, at the Greensboro Coliseum." Keith's note: These are both rather "safe" events (a pattern Bolden has adopted) where media access can be controlled such that no one asks him a space-policy related question on the record - at least no snarky space reporters will get in to pepper Bolden with questions. This is, of course, being done per White House direction. Just to be on the safe side, Bolden will use his new personal transporter to beam into and out of the speaking venues. By Keith Cowing on November 9, 2010 10:47 PM. "The Space Studies Board's 2010 Workshop will explore both how these grand questions focus on the nation's space research program and how best to convey its value and excitement to the public. The workshop will bring together leading scientists and experts from the communications and social marketing sectors to share lessons learned and best practices. A summary of the workshop discussions will be released by the NRC." Keith's note: I just love it when these meetings are set up to address the "public" and their perceptions of space exploration yet 99.999% of the "public" cannot attend. Its also unclear how the public can participate in the "audience". No one stops to think to webcast events like live such that the "public" can see what the experts think they are interested in. Why not let the "public" who cannot attend the event participate via the Internet? All it takes is a laptop with a webcam, an Internet connection, and a USTREAM or LIVESTREAM account. Oh well, the proceedings will quietly slip out in 6 months. As for the speakers - they are all certainly knowledgeable, but with one possible exception, not a single one of them is under 50 years old. What about the next generation? Keith's update: Deputy Associate Administrator for Public Outreach Alan Ladwig has been doing a nice job of Twittering from the event - so there is some insight into what is going on - so make certain to follow Alan on Twitter. By Keith Cowing on November 9, 2010 12:44 PM. "The National Aeronautics and Space Administration (NASA) recently signed an enterprise license agreement (ELA) with Esri, making ArcGIS software tools available for unlimited use by authorized NASA employees and contractors. The agreement reflects NASA's extensive and growing use of Esri's ArcGIS software to bring geospatial intelligence to a wide variety of mission-critical efforts, from streamlining operations to enabling research and exploration." By Keith Cowing on November 9, 2010 12:36 PM. "NASA has selected 13 companies for negotiations leading to potential contract awards to conduct systems analysis and trade studies for evaluating heavy-lift launch vehicle system concepts, propulsion technologies, and affordability. The awards total approximately $7.5 million with a maximum individual contract award of $625,000. Each company will provide a final report to help lay the groundwork for the transportation system that could launch humans to multiple destinations, including asteroids, Lagrange points, the moon and Mars." Mystery Rocket Launch - Who Did It? By Keith Cowing on November 9, 2010 12:08 PM. "A senior official told NBC News it was "possible" that the incident was an accidental launch by the military. However, the Navy, Air Force and Missile Defense Agency said they had no information to indicate they were involved, NBC News reported." "The Pentagon says it's trying to figure out whether a missile was launched off the coast of southern California and who might have launched it. Spokesmen for the Navy, Air Force, Defense Department and North American Aerospace Defense Command say they are looking into a video posted on the website of Southern California television station KFMB." By Keith Cowing on November 9, 2010 12:27 AM. "Showcasing the potential of commercial crew transportation and commercial fixed-price agreements, five company teams selected by NASA in February 2010 under the $50 million Commercial Crew Development Round One program have built significant working hardware in just nine months, new images and data show." By Keith Cowing on November 8, 2010 8:18 AM. Restrictions To Be Lifted on US/Indian Space Cooperation? By Keith Cowing on November 7, 2010 5:21 PM. "There is a clear opportunity to expand our military relationship, especially with the Indian Air Force and Navy, and to boost defense trade by convincing India to acquire sophisticated U.S. defense technology. The U.S. should also support Indian membership in key export control organizations, which would constitute a step toward integrating India further into global nonproliferation efforts. Finally, the administration and Congress should liberalize U.S. export controls that have an impact on India, including by removing the Indian Space Research Organization (the Indian equivalent to NASA) from the U.S. "Entity List." By Marc Boucher on November 5, 2010 3:33 PM. "NASA has decided to postpone the launch of Discovery to no earlier than November 30. This is a result of the hydrogen leak that occurred early in tanking of the shuttle external tank. It turns out there also was a crack in the foam of the external tank." By Keith Cowing on November 5, 2010 2:59 PM. "The head of a NASA Lewis Research Center said that a test was going on at another space agency center, not in Ohio, when they got false reports of a shooter in a building. An employee at NASA Glenn with the same last name as a person at the other center mistakenly received a call at about 9:30 a.m. from an automated system with the message that there "is a shooter in the building." The employee did not realize it was a test. That employee told his supervisor, who then called security and then police, said Director Ramon Lugo III The building was put on lockdown and employees were told to stay in their offices." "Dennis Pehotsky, a retired safety officer at the center, said false alarms are common at NASA Glenn. "Crews are working out there all the time and it never ends, false alarms," he said. "They cut into wires and everything else and they set off alarms. This kind of thing happens frequently." "Lt. Don Michalosky with the Cuyahoga County Sheriff's Office says a message was misunderstood Friday morning while NASA was conducting a test of its automated emergency notification system. He says someone who received the message didn't realize it was a test." GRC Reader note: "People in building 77 were hiding with lights off, and doors locked hoping no one with a gun decided to bust in. And the SWAT team was with guns in the hallway. They even patted down and searched the entire second floor. So all in all it was a pretty interesting day." Continue reading Confusion at GRC Over Security Tests and False Alarms. By Keith Cowing on November 5, 2010 1:23 PM. "Engineers at NASA's Jet Propulsion Laboratory, Pasadena, Calif., are working to understand what caused NASA's Cassini spacecraft to put itself into "safe mode," a precautionary standby mode. Cassini entered safe mode around 4 p.m. PDT (7 p.m. EDT) on Tuesday, Nov. 2. Since going into safe mode, the spacecraft has performed as expected, suspending the flow of science data and sending back only data about engineering and spacecraft health. Cassini is programmed to put itself into safe mode automatically any time it detects a condition on the spacecraft that requires action from mission controllers on the ground." By Keith Cowing on November 5, 2010 1:10 PM. "In response to the recent GAO recommendations and White House direction, SOMD reviewed all prior studies and elected to commission an independent assessment by an objective third party. ProOrbis, LLC was selected to conduct the assessment based on two factors: (1) ProOrbis is a management consulting firm specializing in the re-positioning of sophisticated high technology assets for maximum value generation, and; (2) ProOrbis had no prior history in the civil space sector and thus offered freedom from predisposed biases. In June 2010, ProOrbis was formally tasked to provide within 90 days a "reference model" for an organization and strategic approach that could maximize the value to the nation for the U.S. share of the ISS. The ProOrbis final report, "Reference Model for the ISS U.S. National Laboratory" is the result of that effort." Keith's Note: As far as I can tell, NASA never issued a press release about this report. With all the talk of human spaceflight and commercialization, one would think that an attempt to frame the future uses of the ISS would be of broad interest. Guess not. By Marc Boucher on November 5, 2010 12:50 PM. "After a stormy day Thursday, Friday is looking like a great day to launch. There is a 70% chance of launch with the only concern potential wind gusts at launch time. At this time NASA is currently filling the external tank with its flight load of liquid hydrogen and liquid oxygen propellants." Marc's Update 8:22 am EDT: NASA Managers have made the decision to SCRUB the launch today due to a hydrogen leak at the ground umbilical carrier. This issue has happened before as recently as STS-127. Marc's Update 8:47 am EDT: We're looking at a minimum 72 hour turnaround now. This means if they can fix the issue and if the Orbiter team can extend the launch window then Monday might see a launch. Marc's Update 12:50 pm EDT: NASA managers have decided to postpone the next launch attempt for space shuttle Discovery to no earlier than Nov. 30 at 4:05 a.m. EST. By Keith Cowing on November 4, 2010 11:45 PM. "Unless the post-election lame duck session - controlled by the outgoing Democratic majority - finds a way to fund the STS-135 mission, it will be a tempting cash cow next January as the Republican majority looks for ways to match their belt-tightening campaign rhetoric with legislative action." "Marcia Smith, founder and editor, Spacepolicyonline.com: The Republican takeover of the House is not good news for NASA. It's not that Republicans don't like NASA. As far as I can tell, just about everyone in the United States loves NASA. But they love NASA more in good economic times than in bad, and these are really bad economic times. The message from the election is not just that America is angry at Washington, but that Bill Clinton is still correct -- it's the economy, stupid. Bill Adkins, principal, Center for Space Strategic Studies: Presumptive House Speaker John Boehner proposed during the campaign to roll back federal spending to 2008 levels. In previous years, NASA's budget has been spared from budget freezes while other non-defense agencies have seen their budgets flat-lined, but the game is changing. The current FY11 budget may be NASA's high-water mark for a while." "Wolf is the ranking member of the powerful House Appropriations Commerce, Justice, and Science and Subcommittee, which oversees NASA spending, and will likely assume the panel's chairmanship come January. He has been a vocal critic of Obama's plans for NASA, claiming the president is effectively ceding U.S. leadership in space." By Keith Cowing on November 4, 2010 11:21 AM. "NASA's EPOXI mission successfully flew by comet Hartley 2 at about 7 a.m. PDT (10 a.m. EDT) today, and the spacecraft has begun returning images. Hartley 2 is the fifth comet nucleus visited by a spacecraft. Scientists and mission controllers are currently viewing never-before-seen images of Hartley 2 appearing on their computer terminal screens." By Keith Cowing on November 4, 2010 11:03 AM. "The European Business Innovation Centre Network (EBN) and Space Florida last week initiated a Memorandum of Understanding to develop new market opportunities and resources for Small and Medium Aerospace Enterprises in Europe and Florida. Ongoing activities will further business development and job creation initiatives in the aerospace sector for Florida, as well as establish Florida as the threshold to American markets for European SMEs. The agreement was signed at the European Satellite Navigation Conference in Munich." By Marc Boucher on November 3, 2010 7:46 PM. "Wednesday afternoon NASA's Mission Management Team met at 2:45 pm EDT to review the main engine #3 backup controller issue which caused a day's delay in the launch of space shuttle Discovery. After the meeting a GO was given to attempt a launch Thursday." Marc's UPDATE 6:15 am EDT: SCRUB - NASA will not launch Discovery due to the weather conditions. Low cloud cover, expected ongoing rain have forced a 24 hour delay. Mission managers will reconvene tomorrow at 5:00 am EDT to discuss the weather for Friday's launch. Friday is looking better but expected high winds could be a problem. You can follow updates on the NASAWatch or SpaceRef Twitter accounts as events happen. launch on Friday would be at 3:04 pm EDT. Will The New Republican-Led House Try to Cut NASA's Budget? By Keith Cowing on November 3, 2010 5:14 PM. "The Republicans ran their election campaigns promising to cut government spending and that puts the extra shuttle mission, and much of NASA's future in question. Congress still has to approve billions for NASA. It gave its OK to fly Discovery, Endeavour and Atlantis one more time, but it hasn't provided funding for that last extra Atlantis mission. In fact, NASA needed more money for it and the space agency could be fighting just to keep what it has under the new Congress. While there have been a lot of discussions, and even a vote in Congress to allow NASA to fly the space shuttle Atlantis one more time next year, there's a chance the change in power in Congress could not only keep Atlantis from making that extra trip, it could cut into NASA's future." "In the meantime, with incoming Republican leaders threatening to dial back discretionary spending across the federal government next year, the $19 billion Congress authorized for NASA in 2011 could be in jeopardy. House Minority Leader Rep. John Boehner (R-Ohio), who is expected to become speaker of the House in January, voted against the recently enacted NASA legislation and more broadly has pledged to roll back spending in an effort to reduce the federal deficit." "Boehner also has called for extending tax cuts and reining in federal spending to be priorities. On spending, he's called for ending the practice of rolling many federal programs into comprehensive spending bills in favor of requiring specific votes agency by agency. "Members shouldn't have to vote for big increases at the Commerce Department just because they support NASA," he said last month in a speech at the American Enterprise Institute. "Each department and agency should have to justify itself each year to the full House and Senate, and be judged on its own." By Keith Cowing on November 3, 2010 8:24 AM. "NASA/HQ is holding a Public Day for potential Proposers on the planned acquisition of an entity to develop and manage the US share of the ISS as a national laboratory. The acquisition will result in the award of a Cooperative Agreement. The Public Day will be held on Friday, December 10, 2010, from 9:00 a.m. - 1:00 p.m. at the NASA Headquarters James Webb Auditorium. Section 504 of Public Law 111-267, the NASA Authorization Act for 2010 establishes eligibility criteria regarding the selected recipient of this planned cooperative agreement: 1) the entity must be "exempt from taxation under section 501(c)(3) of the Internal Revenue Code of 1986" and 2) the entity must not have "any other organizational objective or responsibilities on behalf of the organization or any parent organization or other entity." By Keith Cowing on November 2, 2010 7:58 PM. "A LEGO space shuttle headed to orbit helps mark the Tuesday signing of a Space Act Agreement between NASA and The LEGO Group to spark children's interest in science, technology, engineering and math (STEM). To commemorate the beginning of this partnership, the small LEGO shuttle will launch with the crew of the space shuttle Discovery on its STS-133 mission, targeted to launch Wednesday, Nov. 3, from NASA's Kennedy Space Center in Florida." By Marc Boucher on November 2, 2010 5:45 PM. "Although NASA had to work a couple of issues last night, at this point there are no technical constraints that would preclude a launch tomorrow afternoon. The weather outlook is still favorable with only a 30% chance of weather violation. The first issue came up last night was a faulty regulator on the launch pad nitrogen purge system which was repaired. Early this morning though during engine check-outs, the engine 3 backup engine controller did not come up as expected. The problem was narrowed down to a circuit breaker or switch. Transient contamination was narrowed down as the issue which sometimes happens according to Steve Payne, NASA test director. Recycling the breaker and switch solved the issue." Marc 's Update: It seems that backup controller problem which NASA thought was fixed is still a problem. From the latest status update, "Engineers continue to analyze data that showed voltage irregularities and will meet this afternoon to review their data.". Managers are currently meeting to discuss the situation. Marc 's 5:43 PM EDT Update: Launch has been scrubbed for a Wednesday launch. Electrical issues need to be addressed so launch is now set for Thursday at 3:29 PM EDT. However with a 70% chance of violating the constraints for launch due to weather, it would appear Friday is the more likely day for launch. By Marc Boucher on November 2, 2010 4:13 PM. "The project team that built and operates the Mars rovers Spirit and Opportunity has become the first NASA space mission to use cloud computing for daily mission operations. Cloud computing is a way to gain fast flexibility in computing ability by ordering capacity on demand -- as if from the clouds -- and paying only for what is used. NASA's Mars Exploration Rover Project moved to this strategy last week for the software and data that the rovers' flight team uses to develop daily plans for rover activities. NASA's Jet Propulsion Laboratory, Pasadena, Calif., which manages the project, gained confidence in cloud computing from experience with other uses of the technology, including public participation sites about Mars exploration." Marc 's Note: Why isn't JPL using NASA's own Nebula Cloud Computing Platform? By Keith Cowing on November 2, 2010 12:41 PM. "With passage of the NASA Authorization bill, we will now be able to extend the life of the station to at least 2020. Representatives of the five international agencies that built and operate the outpost have also agreed on this in principle. Indeed, one of the station's greatest legacies is the international partnerships we have forged to create something awe-inspiring that benefits people all over the world. Partnerships with other nations will be essential to the global exploration enterprise of the future, and with each new day, NASA and its partners are pushing the envelope of human achievement in space into uncharted territory. On board the station right now are six talented and courageous travelers representing NASA and our Russian partners." Project M: Why is JSC Doing This? By Keith Cowing on November 2, 2010 12:37 PM. "Project M slipped under the radar of everyone else in NASA, including the administrator, Maj. Gen. Charles F. Bolden Jr. In February, in response to a question about projects that NASA might undertake with other nations, General Bolden cited a two-legged robot that the Japanese space agency wants to send to the Moon by 2020. "Do I think I can do that?" General Bolden said. "Probably not." At that time, the Project M team was hoping to get a go-ahead to start in March and accomplish the robotic Moon landing by the end of 2012." Keith's Note: Then again, who's to blame Bolden? Mike Coats has openly supported and encouraged activities at JSC that have been in direct contrast to official policy issued to NASA by the President. In addition, Coats does things like this (Project M) and does not tell his boss, Charlie Bolden, what is going on. Coats is supposed to do what his boss tells him to do and so does Bolden. That's how all Federal agencies are supposed to work. In response Bolden's staff is supposed to do what he tells them to do based upon his direction from his boss, the President. Otherwise you have anarchy where everyone is in charge - and no one is in charge. Small wonder the agency is as fractionated as it is right now. Minimal leadership + lack of workforce discipline = gridlock. Keith's further comments: Sure this would be cool - and the potential uses for humanoid form factor robots has great potential. But Bolden has a point: can NASA really field a bipedal robot - on the Moon? Can they do so on Earth? With regard to the current state of the art of robot design, are there any bipedal robots - anywhere - that can operate autonomously or teleroboticaly that can traverse the terrain one would expect on the Moon (in 0.18G)? Can they do so and also perform meaningful tasks - task that could not be performed better (and more cheaply) by a robot with another form factor - perhaps a rover with arms? Can this JSC bipedal robot pick itself up after a fall? To be certain, the Soviets demonstrated that you can drive things around the Moon by remote control in the 1970s. But to have a bipedal robot walk around - regardless of how it is controlled - is an order of magnitude beyond that. Indeed, JSC has yet to demonstrate that anyone, anywhere, can do this. And yet they claim that they can do this from zero to flight in 2 years has yet to be demonstrated - to anyone. By Keith Cowing on November 1, 2010 1:14 PM. "The frontier of space is rapidly opening to a new generation of travelers - for research and discovery, for adventure and for business. But, with all the social, economic and ecological concerns we face right here on Earth, you might wonder why we need a space program. It is precisely because of these issues that we do need a space program. As we tackle the challenges of exploration, we generate new solutions for problems here, on Earth. Imagine what the future holds." Click here to view the latest Coalition for Space Exploration PSA and Think Outside the Circle. By Keith Cowing on November 1, 2010 1:07 PM. Which Bablefish translates as "[National Space agency net news] on October 21, 2010, Chinese Country Space agency Bureau Chief Chen Qiu sent in Beijing met with NASA Bureau Chief Charles Bor ascends. Sino-US Space agency bureau chief reviewed both countries space agency cooperation course during the discussion, the US side indicated that hope with the Chinese side in the Moon and the planetary science field of activity development cooperation, the bilateral common consent will have the positive practical attitude, expanded and deepens two games in astronautics domain cooperation. (no matter what. Chen asks to ship to Bor to ascend the present "Chang E two" the dummy satellite (Li Jianzhong)"
Keith's Note: Too bad we only have a CNSA picture to demonstrate what Bolden actually did in China in an official capacity. So far the White House refuses to allow him to have any interaction with the media or offer insight into his activities. By Marc Boucher on November 1, 2010 12:48 PM. "At today's briefing NASA managers indicated that there were no technical issues precluding Discovery from launching Wednesday afternoon at this time. After a weekend of repairs everything is proceeding smoothly with the countdown. Weather on the other hand could be an issue." Where Will All The Shuttles Go? By Keith Cowing on November 1, 2010 10:49 AM. "Space shuttle Discovery is ready to fly its final flight this week, but where it will make its last landing is still up in the air. Long thought destined for the Smithsonian, NASA's oldest flying orbiter may actually end up elsewhere unless the Washington, DC institution can find the millions of dollars needed to prepare Discovery for delivery and display, collectSPACE has learned."